When selling your home, the first and most important decision is to find an accurate asking price for your property. If your property is overpriced buyers will likely overlook it. Properties priced accurately will generate more showings and offers and sell in a shorter period of time. To get an accurate evaluation of what your home is currently worth, contact us. When determining the asking price for your home it is very important to look at recent sales in the area. Evaluating the statistics of sold homes in your neighborhood is our first step in attaining a true market value for your property. 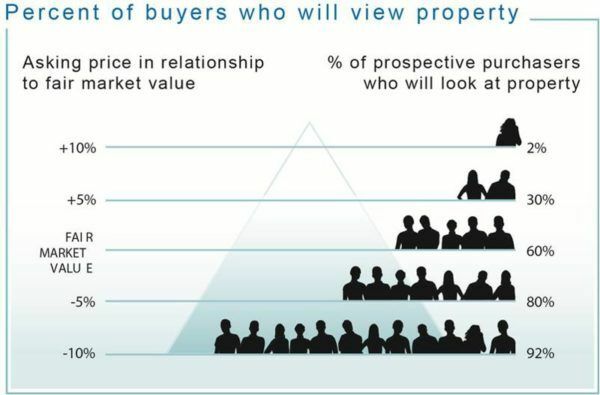 Buyers in today’s markets are well educated and will look at current prices of multiple homes. They want to pay what the home is currently worth, not a potential future valuation or what you paid for the home in the past plus upgrades. Be cautious to not let greed or a specific number get in the way of selling your home. Only homes that are priced accurately will get the attention of buyers. Your goal when listing your home should be to get it SOLD, not just listed.